44.00 mm stainless steel case, sapphire crystal back, screw-down crown, black dial, automatic self-winding COSC movement with hours, minutes, seconds, and date, approximately 46 hours of power reserve stainless steel bracelet. Water resistant to 100 meters. 44mm stainless steel case, black dial, automatic self-winding COSC movement with chronograph function, approximately 46 hours of power reserve, rubber strap. Water resistant to 100 meters. 44mm stainless steel case, 14.56mm thick, with see-through sapphire crystal back, stainless steel crown screw down, diamond bezel, sapphire crystal, pink dial with luminescent numeral, hour markers and hands, automatic movement with hours, minutes, seconds and date, approximately 46 hours of power reserve, pink rubber strap, stainless steel folding buckle. Water resistant to 100 meters. Louis-Ulysse Chopard founded his firm in 1860 in Sonvilier Switzerland when he was just 24 years old. Initially Chopard manufactured pocket watches but after a few years entered the wristwatch and expensive jewelery market. In 1976 they released the Happy Diamonds line that featured mobile floating diamonds and it has been extremely popular. Other styles include Happy Sport, Mille Miglia, LUC L.U.C. 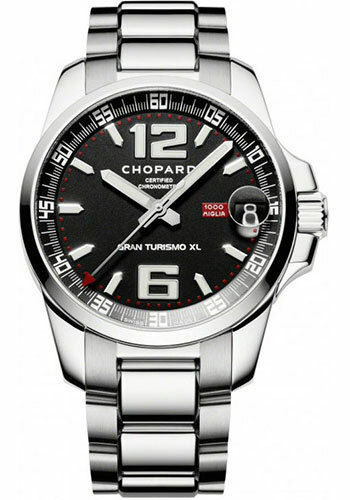 Chopard Grand Prix de Monaco Historique, Classic Classique, Imperiale, La Strada and Superfast. Chopard uses 18K rose, white and yellow gold in their watches as well as stainless steel, titanium and rubber and movements can be automatic, chronograph and quartz. This company has strong corporate and charity partners including Elton John, Porsche, and Cannes Film Festival.